“Woke up this morning to a beautiful snowy wonderland – Only to notice that someone had been tramping threw my backyard. Thank You!! 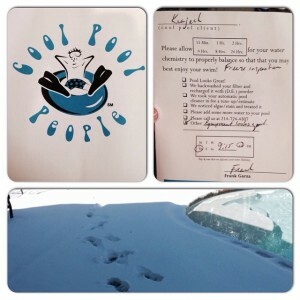 !…Cool Pool People for checking my pool equipment this morning. Peace of mind knowing my pool is running in top shape threw this cold freeze…. Priceless! Best Pool Service Ever! Thanks Todd Gustafson and Frank Garza El Tercero you rock!” – Robin P.
“The pool looks better than it ever has. I definitely made the right choice. Thank you. I did my best to maintain for 2 years but I’m glad you are on the job now. Thanks again.” – Danny W.